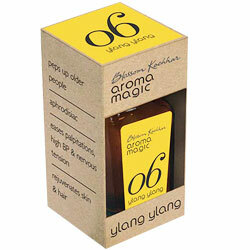 Aromamagic Ylang Ylang Oil - Peps up colder people, aphrodisiac, palpitation, high BP & nervous tension. Eeases palpitation, high BP, and nervous tension. Eases palpitation, high BP, and nervous tension.